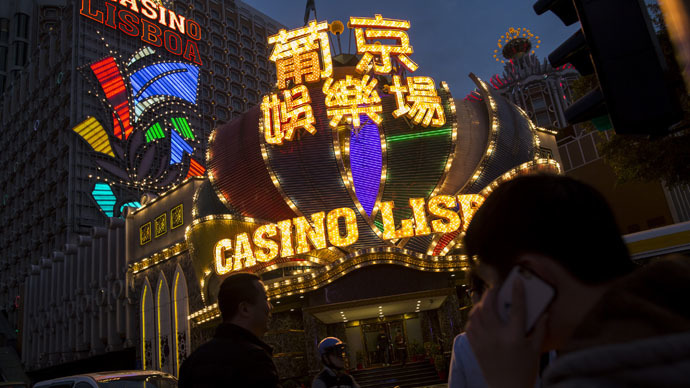 Revenues from casinos in the world’s biggest gambling hub in the Chinese territory of Macau have plunged 48.6 percent in February due to the crackdown on corruption and economic slowdown. Macau is only place in China where casinos are legal. It was revenues fall for the ninth consecutive month to about $2.4 billion, according to data released by Macau's Gaming Inspection and Coordination Bureau Tuesday. The Chinese gambling center overtook Las Vegas as the casino capital in 2002 after the sector was opened up to foreign competition. It brings in about seven times more money than that of the American casino capital. The ongoing crackdown on corruption led by President Xi Jinping coupled with the economic slowdown has scared off a large number of its VIP gamblers, and is now attracting more mass market visitors . During a December visit to the territory Xi made a clear message that it needs to diversify away from casinos. "We believe the biggest culprit for the weak month was the already-troubled VIP segment," Grant Govertsen, analyst at Union Gaming Research Macau told Reuters. "Ultimately, while we believe there was a pickup in VIP headcount, gaming volumes just weren't there," he said. However, Hong Kong-listed Macau casino stocks rose between 1 percent and 3.5 percent on Tuesday, as the posted revenue was largely within the expected range. Analysts were expecting a decline of 45 percent to 55 percent.